You should not have to prove your gender identity to use facilities at a restaurant, hotel, or grocery store. But currently, in the City of Chicago, a transgender or gender non-conforming person could be asked to show proof of gender identity in the form of a government-issued ID. That’s fundamentally unfair. That is why Equality Illinois supports a newly introduced Chicago Equal Access Ordinance that would prohibit places of public accommodations from asking patrons to show a government ID as proof of gender identity to use the restroom. 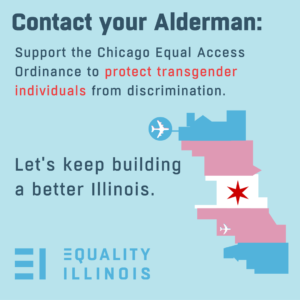 Tell your alderman to vote for the ordinance that would ensure full equal access to public accommodations consistent with a person’s gender identity (Ordinance 2016-3973). If you don’t know your alderman or how to get it touch, look it up here.